Oh, almonds! People have such a love affair with almonds. The trouble is, they're really not something we should be eating lots of all the time. Really. Especially not if they're straight from the bag to our mouths. That's like a double whammy of the Omega 6 Fats (PDF, may take a moment to load) we are aware we're consuming followed by a hit of phytic acid (a mineral absorption inhibitor) to which we may not have given much thought. As someone who admittedly hates supplements and tries very hard not to supplement with anything that I can't chew and eat or stand outside and soak up (ie: the sun)… here's my take: To regulate my Omega 3 to Omega 6 essential fatty acid intake, I work largely on REDUCING MY OMEGA 6 INTAKE and then eating my Omega 3s in the form of grass-fed beef, wild-caught fish and minimal amounts of flax oil or Omega 3 enriched eggs. “Omega 3 enriched,” when referring to eggs, means is that the chickens were fed flax seeds and that the Omega 3 from the flax in the form of alpha-linolenic acid (ALA) is converted by the chickens to the more usable forms for us as humans of eicosapentaenoic acid (EPA) and docosahexaenoic acid (DHA). Humans aren't able to make the conversions from ALA to EPA and DHA as effectively which is why consuming your Omega 3s in the form of flax oil alone will likely not be sufficient for optimal health. All that said, I typically buy the Omega 3 enriched eggs only if I can't get my regular pastured eggs. Reducing Omega 6 intake is best approached by eliminating vegetable oils in the diet (largely canola, corn, soybean and sunflower or safflower- all very high in linoleic acid), grains and legumes. Nuts and seeds tend to account for a large proportion of continued Omega 6 intake for those of us who abandon grains and vegetable oils and move towards an evolutionary diet but are searching for other snacks and easy, on-the-go foods on which to munch. And I'm not the only one dishing out this advice. Check out this podcast interview of Matt Lalonde conducted by Jimmy Moore of Livin' La Vida Low Carb. Matt is an organic chemist and a Harvard-educated PhD and is also a big advocate of reducing these types of Omega 6s in our diets. I've also heard Robb Wolf comment on his podcast that in order to monitor our nut consumption, actually shelling the nuts we plan on eating is a good idea. I like this concept, and if I had a goal of not over-consuming nuts on a regular basis, I'd go for that method for sure. Aside from the Omega 6 content, nuts do contain some other potential gut irritants and lectins so their consumption really should be moderated which is why they're at the tippy top of the Paleo Pyramid. use, it's less than $60! Okay, okay… I hear you! And I understand. I may need to carry some almonds with me as I'm traveling a bunch these days and like to have snacks on hand for my trips. And woman cannot live on jerky alone. Though I use the same dehydrator to make that as well and it's fantastic. Once they're soaked, you can eat them as-is, but the texture isn't really right for me for snacking, which is why I recommend the next step of dehydrating them. 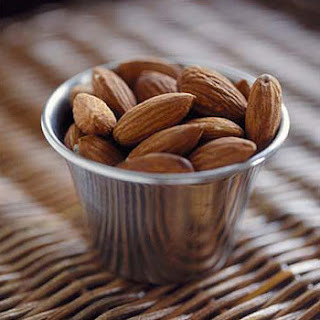 If your goal is to carry almonds as snacks, give them a low and slow warm air vacation. If your goal is to make some almond milk, then give them a whir in a filtered water tornado. (A quick google search for “how to make almond milk” will turn up lots of results with videos too.) I was originally going to tell you to keep the nuts at a very low temperature to dehydrate them in order to keep their oil from oxidizing, but a quick touch-base with Matt Lalonde revealed to me that an in-tact, whole almond won't present this problem as oxygen can't penetrate the nut. That said, roasted nut butters and almond meal or flour that is heated (for all you almond-flour crazed bakers out there!) will cause the nut's oils to become oxidized. We don't want to consume oxidized oils if we can avoid it as they contribute to systemic inflammation and lipid peroxidation – both of which are damaging to our bodies and our overall health. So why bother soaking and then dehydrating the almonds? You may be familiar with the notion of anti-nutrients (or maybe not) and in the case of nuts, the anti-nutrient is known as phytic acid. Phytic acid present in nuts, seeds and in the bran of plants (yes, the bran is what's in-tact when you eat those darling whole grain foods!) that binds to minerals like calcium, magnesium, iron and zinc causing us to not be able to digest and absorb them properly from the foods that we're eating. In general, anti-nutrients are things we should avoid in our foods as best we can, and knowing that there are ways to prepare foods to make them easier for our human digestive systems to digest works to our advantage. Soaking the nuts overnight does a decent job of reducing (though not completely removing) the phytic acid content of the nuts. Generally speaking, the idea that a food requires such careful preparation before it's ready for my consumption makes me a bit uncomfortable and I question whether or not it's even really appropriate as a food. The thing is, at this point I can't make my own life that complicated when it comes to wanting a handy travel snack- so I'm going for some soaked and dehydrated almonds here along with my home-made grass-fed jerky and calling it good-to-go. What do you think? Are you willing to take these steps to be able to eat almonds in a way that is less irritating to your system? Or maybe you'll think twice about eating so many nuts on a regular basis when you realize that this preparation is an IDEAL situation for eating them. Your call. Argh. I thought cutting peanuts and peanut butter out of my life and switching to almonds/butter was a good thing. @Cheryl- fantastic 🙂 Glad you liked this one! A couple year's back, I gave up cow and goat milk for soy milk. Then I found out that soy milk is not good, so I gave that up and switched to almond milk. Does this apply to almond milk too? @Joe- what do you use the almond milk for? Are you making it or buying from a store? Are other nuts okay? I just got a Vita-mix and I like making nut milk and butters with it. How about cashew milk? Cashew/macadamia nut butter? Nut butters-same deal- keep it raw/soaked and try to opt for lower omega 6 nuts- I link to a chart on The Paleo Diet website with info on each kind of nut. Wow. I really need some time to digest and process all of this. Thank you so much for taking the time to break all of this down for us. As a busy working mother-of-three, it almost becomes disheartening when you think you might finally be on the right track. My small kids have traded in their Goldfish, pretzils, and Cheerios for fresh fruit, vegetables and nuts, and now I have to consider buying a dehydrater and limiting their almond intake – a favorite in our home. What veggies do you think are best for snacking? I have a 3 1/2 year old and a 19 month old and the 19 mon old doesn’t have any molars yet-so chewing raw veggies is always an adventure!! I use the almond milk (organic store bought) for post-workout nutrition, usually mixed with raw almond or cashew butter (again, organic store bought) for extra fat and extra calories plus a scoop of–I know you're going to kill me–whey protein powder (but from grass-fed cows if that lessens the sting).. I'm trying to figure out a way to get enough calories in a day. I was planning on throwing some coconut oil into the mix. I already eat a lot of macadamia nuts for fat and calories. Old school way to gain weight was to drink a gallon of milk a day, but I'm clearly not going to do THAT. I take my fish oil and eat fish regularly and grass-fed meats, plus lots of fruits and veggies. I'm just praying that this balances out the my post workout "baby formula" as my wife likes to call it. I don't eat cereal or anything like that anymore, and honestly, I'm having a difficult time replacing those convenient calories. If I don't sneak in those calories with my baby formula, I lose weight. I'm at 5.1% body fat and can literally lie down at the bottom of a pool like a piece of deadwood to the amazement of everyone who thinks people should float. I know most people would kill to have my "problem" but I want to pick up heavy things and put them overhead, lots of times and quickly. And being heavier helps that proposition. Me again 🙂 I use the nut milk for green smoothies in the AM with greens, avocado, and berries. I used to use coconut milk, but I am not too fond of the way that Vita-mix actually makes coconut milk. I am trying to stay away from all preservatives in the canned coconut milk and of course the packaged nut milks. I also like the idea of making fresh (within a few days) "Milk." I eat mostly paleo and stay away from gluten and dairy. Although I do add whey sometimes to my smoothies (the organic one). Thanks for the info and response. Hey I was also told that hazelnuts are a "top" nut choice…those being hazelnuts and mac nuts. Gave up the easy way out with almonds a few weeks ago…now it's lots of avocado, coconut oil/milk and olives with occas hazelnuts or macs! I love this brand of olives. I don’t think eating one daily is going to be harmful, but with every food out there… if you love it, rotate it! If you want to eat it a couple of days in a row, then take a couple of days off. You can add coconut to the mix for some good, varied fats. Do you ever soak and dehydrate other nuts besides almonds? Or is it not necessary with other nuts? I’m thinking pecans, walnuts, macadamias. What about gently roasting them, doesn’t this also inhibit the enzymes? Also you can buy white almond butter, which doesn’t include the shells, I think this may be slightly better. TBH I have stopped eating as much almonds after I overdid it on with my almond flour based carrot cake. I also don’t consider them nutrients, as they don’t really seem to be digested. I make my own almond milk using a Hurom Juicer. What about sprouted nut? Are they any better? I know they are more digestible, but do they contain less anti-nutrients? Sprouting initiates the life-process of the nut/seed so it does release some of the anti-nutrients in them… consider that they’re letting their guard down to begin to “grow” into their potential… it does make them easier to digest but doesn’t eliminate the problems we may have with them. I am with joe on this one. Since switching to paleo I am starting to look skeletal. I am getting way too thin and I don’t know what I am doing wrong. I do turn to nuts as a major source of fat and knowing I should cut back is upsetting. I am nursing my 19 month old don but I’m not sure if that is the issue. My husband eats less than me and is fine. If you’re nursing and not trying to drop weight you need around 500 calories MORE per day. I’d eat an extra meal if I were you, Danielle! What are your feelings about almond flour? I address almond flour in the post… re-read it perhaps? I am curious about the same things, searched for almond flor and couldn’t locate it. Can you add a link? I recently purchased some raw almonds and wanted to soak/dehydrate them. I glanced at a few different sites and ended up soaking them in warm salted water. However, I soaked them longer than intended—-I’d say a little over 20 hours. There was definitely a fermented smell occurring and little brownish “deposits” in the water. I tossed the soaking water and rinsed briefly. Now I’m dehydrating them but a hint of the fermented smell lingers. Is this still okay to eat or should I toss? Obviously I’d rather not waste them if possible but don’t want to be foolish about it either. Any thoughts are appreciated. I’m not sure if I would eat them, but I don’t know much about fermented nuts/seeds. Now that they’re fully dehydrated, there’s no more smell. I think you’re right, however. Thanks for your reply! What about all the almond meal used in baking. Any thoughts on that? Am always looking to be healthier. Everything you commented at the beginning of your blog applies to me. As a hard gainer I rely heavily on almond butter, avocado oil & olive oil. So my question is this…if I show no signs of gut problems and am not deficient in mineral/vitamin…do I need to worry? I’d recommend good quality EVOO, coconut oil, butter and animal fats over nuts as a dense source of calories. Like all things that we think are paleo, almonds definitely are. But consider how many almonds or nuts of any kind our paleo ancestors would have had access to at any given time. Labor intensive to gather and process, they would not have had the abundance of nuts available today. Since nuts are easier to store, many would have probably been eaten throughout the winter and early spring, but how many? Probably no more than a handful a week. Maybe less. And probably less during the spring and summer with other foods being more abundant. If you are really trying to keep paleo and are concerned about eating too many almonds, go through the thought experiment. Use that as a guideline for how much to eat and when. The same applies to other foods too. What would Grok do? Glad I found you Diane…love your new book! I’m not tolerating cow’s milk at the moment though I hope to eventually. I have access to clean raw milk from pastured cows so I feel like I’m missing out. I use almond milk to wash down dark chocolate mostly, or I’ll just have a glass here or there. There’s plenty of times when I’ll not even have any almond milk for a week, so I think I’m being moderate enough with it. I take about a week to drink a litre of almond milk which I make in a Soyabella. (You use one cup of soaked almonds to make this litre) The leftover almond ‘meal’ is partially defatted from the making of the almond milk? Yes/no? This may be a better choice to make some almond meal pancakes or muffins than commercial almond flour (which should have the fat intact. I’m just looking to add variety and to have something snacky once in a while, not make almond goodies an every day thing. Is the leftover almond meal hard on the digestion? I feel minor irritation (mouth, no GI) when eating them with the skin on. I feel NO irritation from eating them with the skin removed (soak ~8 hours/overnight. 1 water change preferable). If your diet is essentially all strict Paleo (non-grain) otherwise, your fatty acid balance should not be a problem. Your body will tell you when you have had ‘enough almonds’ anyways, so just stop eating then when you’ve had enough. Thank you so much for this Diane! I really appreciate all of your clear and helpful information. When I did your 21-day detox in mid-January, I way overdid it on almonds and almond butter (I learned that I actually feel awful after eating almond butter), but looking back on it now that it was a month ago, even though I over compensated for lack of other snacks, I can say it was still awesome to be in a state where I could actually pinpoint what was affecting me. At the height of my diluted pre-detox, fructose- and gluten-belly haze, I couldn’t even notice when dairy was affecting me (and I know that I’m intolerant! I was in such a low state that I was reaching for cheese.) Now after taking a little distance from the detox and evaluating my aware but not hyper-vigilant daily intake, I can now have the strength to make these fine-tuning adjustments like soaked nuts in very small quantities. I still have some work to do to get my gut health on track, but every time I listen to your podcast or read your blog posts, I feel closer to my goal and stronger in my resolve. A million thanks!! My husband, who has heart disease but controlled by statins and vitamins, and I have been consuming almond milk for about 2 years (after eschewing soy and cow’s milk) on our AM cereals 3/week, organic Sensha green tea and 1/2 cup steamed almond milk. We also have been eating freshly ground almond butter on our organic Fuji apples (once/week) and toast (3-4/wk). What are the adverse effects of almonds as I have outlined above as part of our diet? I’ve been suffering with chronic constipation; itching w/resultant eczema (I suffered with childhood eczema w/food allergies of eggs, chocolate); bladder irritation (D-Mannose is fantastic for this and for UTIs). We are retired and buy as much organic food as we can afford; is coconut milk the best for us? Almonds are GOOD. You are basing your decision to avoid omega- 6 on a childish understanding of the science. Mark Sisson is a total scammer. Look up Dr. Dariush Mozaffarian and the omega -6 MYTH. Info in this article is way to peculiar. I’d rather just grab a handful of raw almonds than think long and hard on getting the perfect and purest 3-6 ratio of fats when in reality it’s not going to make a long-term significant difference and both of them are very healthy overall. Most health conscious people will cheat on some saturated fats once in a while anyways which also won’t make much of a difference in overall health as well. As long as you are buying food in their most whole state, and eating a varied omnivorous diet, obsessing over omega 6 is unnecessary. Buy the nuts with the shells still on them, and call it good. Nuts and seeds are the best sources of magnesium and manganese. Agreed. This is a very old post, FWIW, and I always recommend that folks simply don’t overdo it on nuts, as it is especially common when folks go grain-free/Paleo. Wow I’m so upset. I already can’t have bread because I’m paleo and now nuts too? What about seeds? Are those okay? Like chia seeds, flax seeds and hemp seeds. What about coconut flour? Is it okay to have coconut flour bread instead of almond bread? Coconut flour is so many more calories though. What do you recommend for a paleo snack with low sugar? Other than jerky. upset?! I am simply saying not to go overboard – and, in time, your need for bread will shift 😉 you can have whatever you want, it’s all about choices and knowing what’s best for your own body!